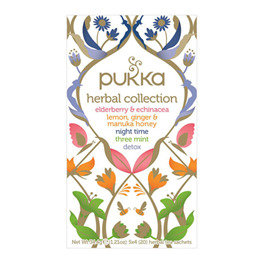 Pukka Teas Herbal Collection offers you a collection of five of Pukka`s delicious, award winning organic teas. They are each made from three varieties of the herb to deliver an exceptional depth of flavour. Elderberry & Echinacea: Caffeine-free herbs provide a cold-busting tea with berries, echinacea and a touch of sweet elderflower. Lemon, Ginger & Manuka Honey: A warming and soothing tea with zesty lemon, spicy ginger and nourishing manuka honey. Three Mint: Organic peppermint, spearmint & field mint tea to refresh & soothe digestion. Detox: Delightfully refreshing and cleansing herbs to ease digestion, detoxify and support overall health. Naturally caffeine free and ethically sourced ingredients: Licorice root*, ginger root*, echinacea root and leaf*, beetroot*, aniseed*, elderflower*, peppermint leaf*, orange peel*, elderberry*, rosehip*, acerola juice flavour*, orange essential oil flavour**, natural blackcurrant flavour. *Organic ingredients (99.9%); **Contains non-organic lecithin. Naturally caffeine free and ethically sourced, organically grown ingredients: Ginger root* (32%), licorice root, elderflower, fennel seed, lemon verbena leaf, turmeric root, lemon essential oil**, lemon myrtle leaf, whole lemon (4%), manuka honey flavour* (2%). *Contains non organic antioxidant: ascorbic acid; **Contains non-organic lecithin. Oat flower (30%), licorice root, chamomile flower, lavender flower (14%), lime flower (10%), valerian root, green Rama tulsi leaf. Aniseed, fennel seed, cardamom pod, licorice root, coriander seed, celery seed. 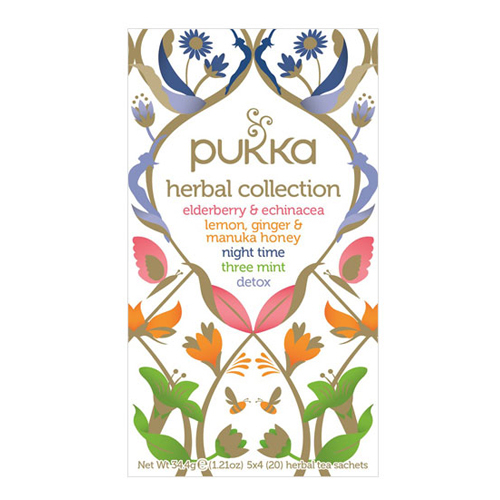 Below are reviews of Pukka Teas Organic Herbal Collection - 20 Teabags x 4 Pack by bodykind customers. If you have tried this product we'd love to hear what you think so please leave a review. I love these organic teas. Very in depth flavours and such a variety. Great that you can order in bulk. Lovely selection of teas. Nice to buy in bulk, as it's cheaper that way. My favourite choice of teas. I wanted to have some caffeine free versions from my normal dark tea, and tried these varieties. Definitely my preferred flavours, having tried other infusions from other companies. I like the fact that I can buy in bulk as well.